Divio Addons offer new applications with additional features that you can easily add to your website, without coding them yourself. In addition to the pre-built Addons, Divio Cloud also allows you to add your own custom Addons. 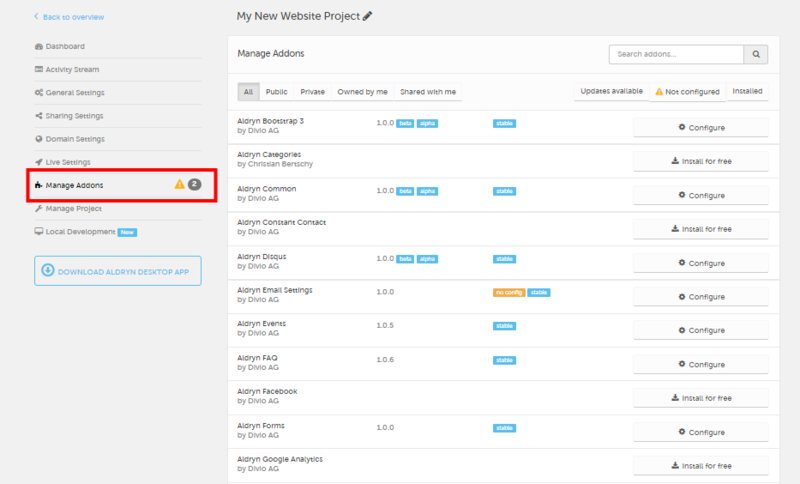 Go to your Divio Control Panel and select the project you want to work with. From the Project menu, select Manage Addons. To search through your Addons list, use the search box at the top right or filter using the criteria at the top of the list. Addons that are already installed will have a Configure button in the list, while those that are not yet installed will have an Install for free button. Addons that are already installed, but not yet updated to the latest available version will have an Update to … button. To install an Addon, hit Install for free. Once your Addon-specific configuration is completed, you can choose a Release Channel (for example, if you’d like to try out a Beta release rather than the standard Stable version). Hit the Install… button to complete the installation. To configure an installed Addon, select its Configure button. Change your settings as required in the Addon configuration dialog. Please note that the configurable settings will be different for each Addon. 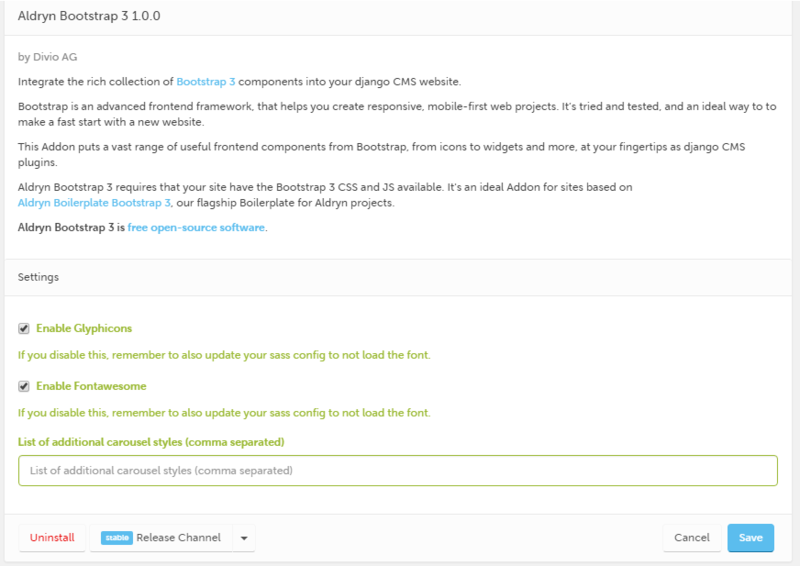 Once you are satisfied with your configuration, select a Release Channel if required for example if you want to try a Beta release rather than the default Stable version. Hit Save to apply your configuration changes. Important: remove all apphooks, plugins, navigation extenders and any other references to the Addon before attempting to uninstall it. Find the Addon you want to remove. In the Addon configuration dialog, select Uninstall. Confirm that you are sure that you want to uninstall the Addon. You will be warned that removing the addon can have unwanted consequences if there are any apphooks, plugins or other references to the addon in your code. If the Addon is removed, those references will no longer be valid. Please first ensure that the uninstallation will not affect any other areas of your website and select I know what I’m doing when you are ready. If in doubt, cancel the uninstallation and check before proceeding!